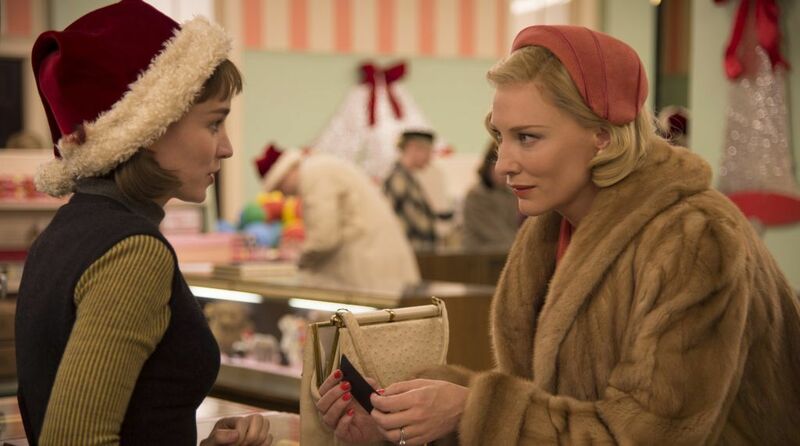 “Carol” marks the first time writer/director Todd Haynes is working off a screenplay not his own. He partners here with Phyllis Nagy (a theater and film writer/director in her own right) who adapts Patricia Highsmith’s 1952 novel The Price of Salt, a writer who at the time used a pseudonym due to its lesbian content. Time is something that plays a huge factor in “Carol” since homosexuality wasn’t openly discussed, let alone embraced, back in the early 50s. Just as Haynes paid homage to the style of Douglas Sirk when he made “Far From Heaven”, his latest finds him influenced by David Lean, specifically “Brief Encounter” from 1945, which centered on a married mother whose conventional life becomes increasingly complicated because of a chance meeting at a railway station with a male stranger. They inadvertently but quickly progress to an emotional love affair, which brings about unexpected consequences. 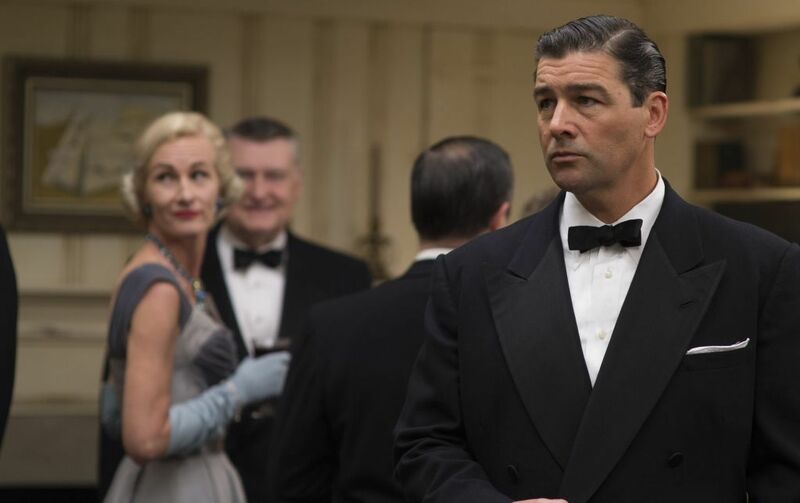 In this case, the expectedly sublime Cate Blanchett plays Carol Aird, who is in the process of separating from her husband Harge (Kyle Chandler), which will lead into difficulty when it comes to the custody of their daughter. There is already suspicion that Carol is a woman unfit to mother her child due to her questionable morals and previous close relationship with a close family friend, Abby (Sarah Paulson), who is also godmother to Carol’s daughter. 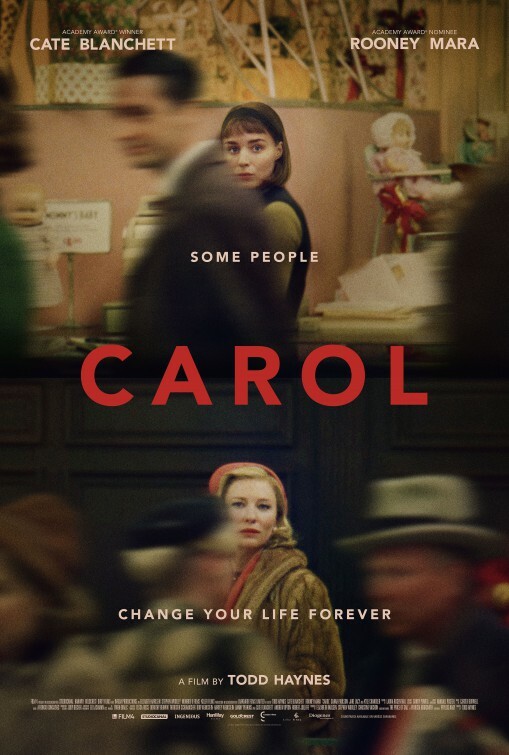 One day Carol makes eye contact with a young shopgirl and budding photographer, Therese Belivet (Rooney Mara), at a department store and the two immediately connect. Carol knowing she is attracted to Therese and Therese knowing the spark has been ignited. Soon, relationships are cut off and two take a road trip where their love for each other is established and also outed in a most harmful and unfortunate way. Here is a moving drama that could’ve affectively been made as a silent film. Not because there’s any problem with Nagy’s dialogue or narrative – there absolutely is not – but because Haynes and his two leads show so much without telling us hardly anything. Haynes focuses on the longing in brief looks, the inner turmoil that appears on tired expressions of characters who must hide who they are and the hands that secretly rest on a shoulder or touch another hand – and he has Blanchett and Mara to carry the movie with their intensity and aching. They are both equally astounding in complex roles that require timed subtleties and honed nuances. My problem with “Carol” is kind of a pivotal one. I wasn’t convinced Carol and Therese were experiencing love. Infatuation? Sure. Exploration? Yes. Escapism from the monotony and expectations of their daily lives. For sure. But although they had undeniable chemistry, I never detected love – which is kind of what the film hinges on. The character I felt for the most was Paulson’s Abby, who knows all too well what Therese is embarking on and exploring. It’s a revealing role that offers context and depth to the entire film. Haynes is a meticulous filmmaker and never is it more evidenced than in this measured film. He and cinematographer, Edward Lachman, who previously worked with the director on “Far From Heaven” and 2011’s “Mildred Pierce”, carefully focuses on gestures and gentleness amid bold colors and the cold environments of wintry roads and car interiors. Costume designer Sandy Powell dresses everyone appropriately with just the right cut and look for each character and Carter Burwell’s score is both enchanting and heartbreaking, following the restrained characters as attentively as the viewers. 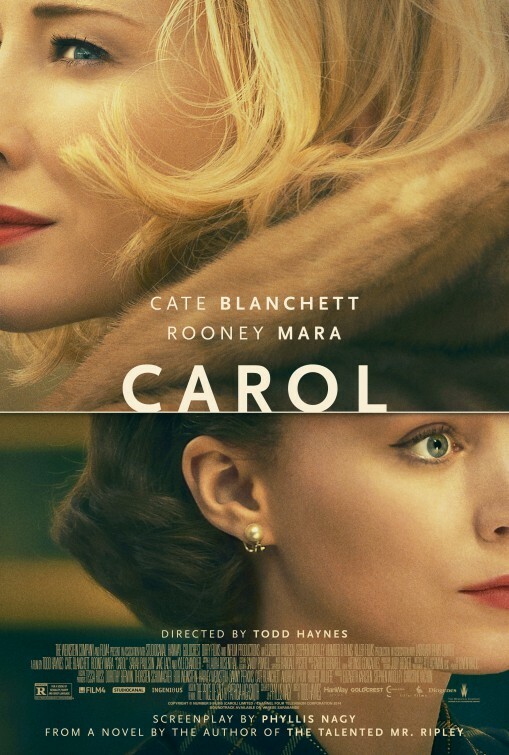 I’ll definitely be expecting multiple nominations come awards time for “Carol”.